Two Sundays ago I was here, at the Valley of Fire state park in Nevada, hiking through some of the most fascinating rocks I’ve ever seen. 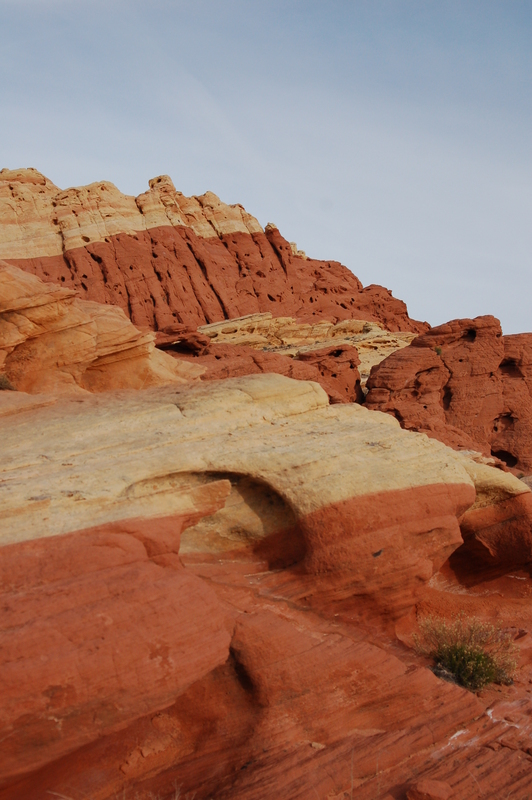 As you can see in this photo, taken by my boyfriend, the rocks shown here at the divide between the Silica Domes (the white sandstone) and Fire Canyon (the red sandstone) are two distinct colors. We hiked down a former stream bed through the domes to this point and beyond. We were shocked at the practically perfect split between the colors. One of the signs explained that it takes only one particle of iron out of one million for the stone to turn red across a wide area. This state park is located between Interstate 15 and Lake Mead in Nevada. It’s about an hour-long drive from Las Vegas. This entry was posted in North America, Photos, Wednesday photo and tagged Las Vegas, Nevada, Photos, Rocks, Sandstone, State parks, Travel. Bookmark the permalink.